If you are a business with multiple sites, it’s more than likely that you are considering an SD-WAN deployment. 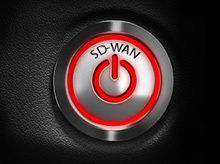 However, if your IT team is moving forward on SD-WAN without considering the security implications, then you are missing half of what’s needed in a full SD-WAN implementation. As bandwidth requirements and Internet costs grow, businesses naturally want to manage budgets by reducing reliance on their most expensive connection types. At the same time, they need to elevate the productivity and efficiency of their workers with fast, direct access to Cloud applications and with network performance that supports high quality VoIP and video utilization. As a result, today’s midsize and distributed enterprises are demanding automated network solutions that measure and send traffic to the most appropriate WAN connection…continually optimizing for cost and quality. These software-defined wide-area networking, or SD-WAN, products can decrease the use of expensive MPLS or 4G/LTE connections for Internet cost savings, or organizations may choose to maintain their leased private lines and focus benefits on network resiliency and performance enhancements. In concert with SD-WAN implementation, many companies are looking to improve the user’s network experience by moving from a traditional hub and spoke network architecture to a “hybrid WAN architecture.” Rather than sending all traffic from remote sites back through a central data center, with hybrid WANs, some traffic goes directly to the Internet and Cloud applications. This traffic previously had security applied at the headquarters, and so unless upgraded, comprehensive perimeter security is added at the branch location, and a new door may be left open for cyber attacks. Considering both cost and ease of deployment, an all-in-one solution offering enterprise-grade security and SD-WAN networking features is the preferred approach to gain SD-WAN benefits while maintaining adequate security. What Should You Look for in a Complete SD-WAN Solution? The differences in SD-WAN solutions are small until you consider the security upgrades needed at the branch office or distributed business site. The table below identifies some key areas of inquiry as you consider different SD-WAN alternatives. Get the SD-WAN Resource Kit! Get started with WatchGuard SD-WAN today! SD-WAN functionality is included in our award-winning firewall, for the strongest protection, simplest management, and lowest overall total cost of ownership (TCO). Businesses implementing SD-WAN need to deliver enterprise-grade security. Total Security Suite provides defense-in-depth with the visibility and reporting needed to manage multiple sites.